The World Best Times were spread over two of the five days of racing and included the men’s single sculls time falling twice in the same day. The final time went to Clarke Dean of the United States whose winning time of 6:45 in the semi-finals yesterday brought him to within one second of the under-23 World Best Time. Dean took gold in the final today ahead of Australia’s Cormac Kennedy-Leverett and Tristan Vandenbussche of Belgium who won silver and bronze respectively. Dean’s medal also helped the United States to finish at the top of the overall medals table. The US won a total of seven medals. This included two gold medals with the women’s four also winning gold. The United States held off the fast-finishing Italians to win the gold with New Zealand coming through in third. Italy was second on the medals table with five medals, two of them gold. The golds were a double-header in the coxed four with both the men and women winning. This is the first year that the women’s coxed four is included the junior championships, giving Italy the inaugural win. Australia was second and the United States finished third. The bronze medal US crew also set a new junior World Best Time earlier in the week in this boat class. Great Britain finished in third on the medals table, while the Czech Republic and Romania came in at fourth equal. This is a drop for Romania who topped the medals table in 2017 in Trakai, Lithuania. An outstanding performance by Romania’s women’s single sculler, Tabita Maftei secured one of her country’s two gold medals. Maftei’s win saw her stay ahead of the reigning junior champion, Esther Briz Zamorano of Spain as well as Argentina’s Maria Sol Ordas who had set a new junior World Best Time the day before. Ordas claimed silver while a closing sprint by Italy’s Greta Martinelli earned her the bronze. Romania took a surprise win in the men’s pair when Florin Arteni-Fintinariu and Alexandru-Laurentiu Danciu finished first ahead of the reigning junior champions, Patrik and Anton Loncaric of Croatia. The Loncaric twins had set a new junior World Best Time the day before and then won the bronze medal in the final, while Germany’s Elias Kun and Jasper Angl took silver after finishing third in 2017. 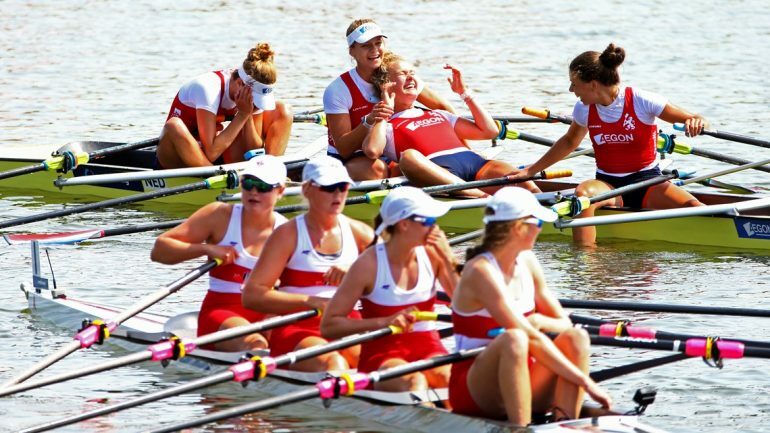 The women’s eight and men’s quadruple sculls races stole the hearts of the crowd and earned two gold medals for the host country. The Czech Republic win in the women’s eight saw them defend their 2017 title with the men’s quad holding off Germany and Great Britain to take the win in that event. The men’s eight brought the regatta to a close with Great Britain dominating throughout the race. The United States held on to second with the reigning junior champions, Germany finishing in third. In 2019 the World Rowing Junior Championships will go to Tokyo, Japan where it will double as a test event for the Tokyo 2020 Olympic Games. The 2018 World Rowing season now moves on to the World Rowing Championships from 9-16 September in Plovdiv, Bulgaria.